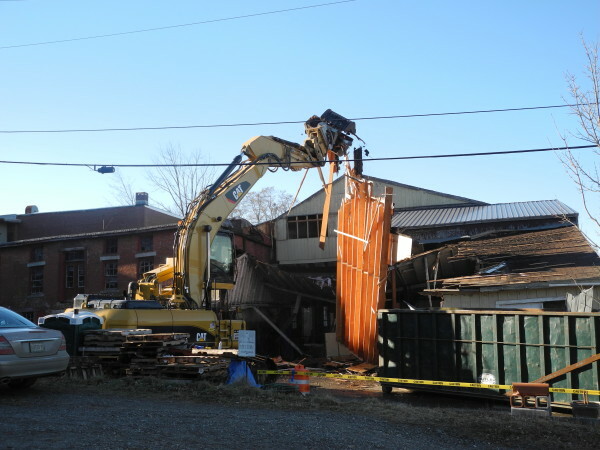 A demolition crew began to take down two large buildings on Monday on Washington Street in Belfast. The 1.3 acre parcel is being cleared and contaminated soil on it removed so that the family that owns the land can develop it. 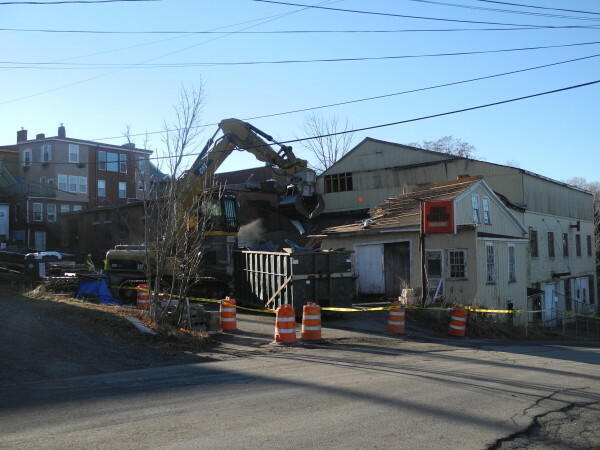 BELFAST, Maine — Eunice Palmer and her daughter, Diane Bergey, couldn’t hide their enthusiasm Monday when, after years of planning, a demolition crew finally began to take down the buildings they own on Washington Street behind the Home Supply hardware store. Ultimately, the massive demolition project and a cleanup of contaminated soils on the site will clear 1.3 acres of downtown property for future development. The women would like to one day create thousands of square feet of retail space and more than a dozen nice apartments on the land. But for now, they are simply relieved that demolition has begun. Although the buildings are located just behind the busy downtown business district on High Street, in some ways they don’t seem part of the thriving midcoast-area city. Bergey said that her father, Dale Palmer, had begun to buy up the properties nearly 40 years ago, when Belfast’s economy was very different. It was during the end of the chicken processing and shoemaking industries, and the hardware store was one of the few storefronts on lower Main Street that was not vacant, Bergey said. “It was hard and scary,” she said of the business climate at that time. Nevertheless, Palmer purchased the buildings and land that had housed a blacksmith shop, a car dealership and a coal gasification plant as they became available, with a long-term dream of turning the area into something great. Eunice Palmer said that the project would have been started sooner, but her husband died, and plans were put on hold. Then, a couple of years ago, when family members again started to get serious about the development project, they learned through the U.S. Environmental Protection Agency’s Brownfields program that part of the property was contaminated. Central Maine Power had operated a coal gasification plant there in the 1930s and had left a lot of polluted soil behind. It is Central Maine Power’s responsibility to clean up the contaminated soil, a massive task that is expected to take more than four months and cost at least $1.8 million, according to city officials. At last week’s Belfast City Council meeting, officials approved a request to close a portion of Washington Street from late January to mid-June so that CMP can do the work. Tammy Lacher Scully, whose home is located next to the former CMP site, told councilors that she is not in favor of removing the polluted soil. The project will be disruptive to the neighborhood and could have detrimental health effects as the carcinogenic coal tar is taken away. “I’ve gone from being somewhat not in favor of this project to being completely opposed to it,” she said. CMP’s cleanup consultant, Steve Kelley of Portland-based Haley & Aldritch, told councilors that the contaminated soils are likely to produce unpleasant smells but are not defined as a hazardous material by the EPA. Bergey said that after the demolition and the disruptive soil clean up have been completed, the future of the area will be better. Her family cannot move forward with the development until the property has been rehabilitated. Provided they can get contracts for tenants and bank financing, they would like to break ground as soon as next fall. “I think the project, if it goes through as planned, will be great,” she said.